The picture 1 is representative of what you see on 90% of Y73.1 dragon dollars: this is the most common variety. The calligraphy shown on picture 3 is called 中折金 and is much scarcer: both side strokes of the 金 radical are curved in a very noticeable way. Even more rare, the 挑金 variety (picture 2) is easily identified by its incurved left stroke. 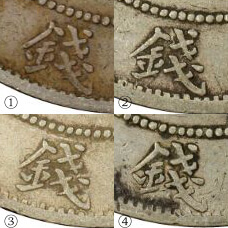 The rarest of all the varieties is the 双折金, with characteristic vigorous tapered strokes on the side and bottom (see picture 4 and details). 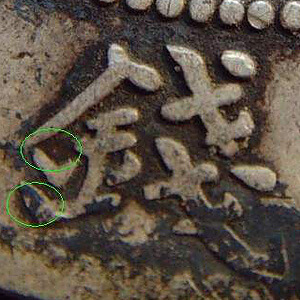 If like me you collect Pei Yang 29th year Chinese silver dollars, be on the lookout for these rare varieties: while they enjoy some popularity in China, most collectors abroad are still unaware of them, so there is good opportunities around. 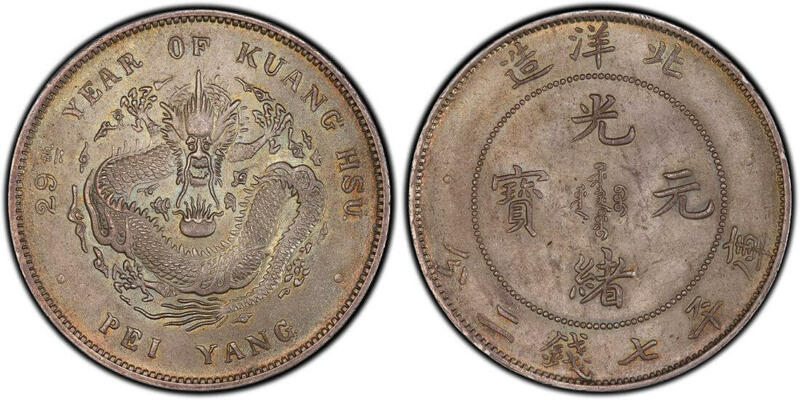 i have one of the pei yang dragon dollar made 1903. original. I haver 2 very similar coins-can someone help me learn about them? I have 7 mace and 2 candareens coin. I have pei Yang coins in 29 th year of kuang Hsu .. I have a 29th Chinese dragon how can I tell if real or counterfeit? Đồng đô la Peiyang năm 1903 trị giá khoảng 250 USD trong tình trạng tốt. I have one kuang hse coin and 2 other old coin… can anyone help me to identified real or fake. I have 4 coins, 2 of them say ” 7 mace and 2 candareens”, 1 is a 29th, and one has a picture of the emperor i think. В моем экземпляре доллара написание иероглифа отличается от данных четырех, а также имеется надчеканка.